This is compiled from their delivery from USA in 1943 to the latest goings on with the 7 remaining ML's (destruction of Tamaki Tram Haku aka Black Watch.- in the last 2 weeks) in 2018. I am open for donations if those images above aren't related. Also I would like to find any pictures of Q1351(no Penant Number in P mode)also known as Aoteroa (Mt Maunganui)and Pakatoa (of the same island name) Even some dits surrounding her would be hugely beneficial. Here is the blog for ML related data - to note this is just an ML blog, not Fairmiles. My email is zappydodah@hotmail.com for donations. Thank you Dave. Just like Home. Kia ora katoa e hoa. Since my initial post here on the 3/10/2018 I have added 19 new images including two sets of plans (could be useful for Modellers) and three lots of text/blurb. Feel free to view etc. I have recently received another 3 images and a comprehensive blurb on his (Tony Bullock) association with ML's featuring his time on Maroro and his Fathers association with them too. They can be found under the Maroro section of the blog. Kia ora and happy new year WONZers. Have updated the blog with another batch of photo's and ditties. Mainly in the Maroro section. Would appreciate any material on Kahawai. Email is zappydodah@hotmail.com or FB Messenger under Thane W Zander. Harking back to the first post/photo on this thread, I am a bit confused at the statement that this launch (in 1954) was in the scheme "before the B&W Fisheries livery". 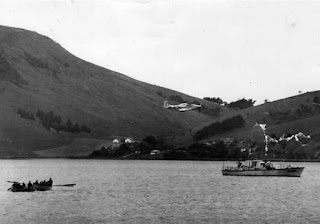 I had never heard of that scheme being described as the Fisheries livery, although as kids in the late 1950s and early 1960s we frequently used to see the Lyttelton reservists visiting Pigeon Bay from time to time, pretty certain they were nothing to do with fisheries protection. The boats did look pretty sharp though, all Shipshape & Bristol Fashion. However, after reading through R J McDougall's book on the ships of the Royal NZ Navy, it seems that the black and white hull scheme was used on most of the surviving SDMLs post 1960, including those associated with the RNZNVR Divisions, although the two used as survey craft were overall white for quite a long time, to differentiate their specialised role. Probably best simply to refer to this scheme as the B&W hull scheme, and leave it at that. Thanks for that advice, David. Livery refers to the colour scheme, 3 in all (WWII dark grey, Post WWII Light grey and 60's onwards B&W.) Tarapunga and Takapu were always White as was Paea in the 70's (seconded to Survey duties upon decommissioning of Lachlan. ).